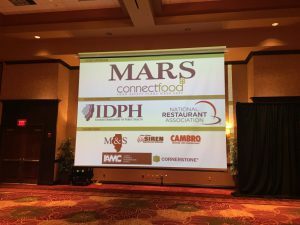 On August 8th and 9th, 2017, the ConnectFood team hosted the 2017 Illinois Food Safety Symposium in Bloomington-Normal, Illinois. There were nearly 250 food industry professionals that attended the two day event. 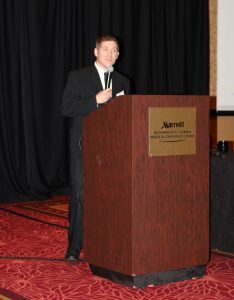 ConnectFood organized and led the Symposium in order to continue the tradition, previously established by the Illinois Department of Public Health of bringing together regulators, academia, and industry professionals in order to work towards continuous improvement of the food safety environment in Illinois. If you were unable to join us at the Symposium, we hope you enjoy this short overview of what you missed, and that you’ll be interested in attending next year! The Symposium was started the Keynote address from Mike O’Grady, Vice President of the Bloomington-Normal Economic Development Council, and Molly Lamb, Deputy Director at Illinois Department of Public Health. Both touched on the fact that the food safety industry in Illinois is incredibly strong, but that there are many areas that are being expanded and strengthened. Matthew Botos, CEO of ConnectFood, introduced two of our exhibitors: Cheryl Hodges from Miller & Stryker, and Renee Hoggay from the National Restaurant Association, and encouraged them to speak about their products and businesses. Matthew Botos, CEO, ConnectFood, welcoming the crowd to the 2017 Illinois Food Safety Symposium. As participants refilled their coffee mugs and grabbed morning snacks, Dr. Robert Brackett, Director of Institute for Food Safety and Health set up for his discussion of Food Safety Modernization Act (FSMA) & Compliance. He began by introducing the foundation of FSMA – why is it necessary? In the shortest summary possible: FSMA is necessary because food supply is more complex, and an increased percentage of the population is at risk for foodborne illnesses. 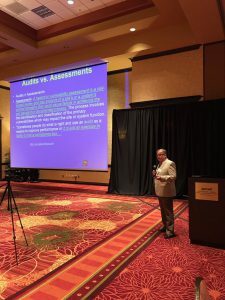 Dr. Brackett also covered the seven rules of FSMA: Preventive Controls for Human Foods and Animal Foods, Produce Safety, Foreign Supplier Verification Program, Accredited Third Party Certification, Sanitary Transport, and Intentional Adulteration. The first FSMA Compliance dates are right around the corner (this month, in fact): September 17-19th, 2017, so if you need help making sure you’re compliant, now is the time to act. 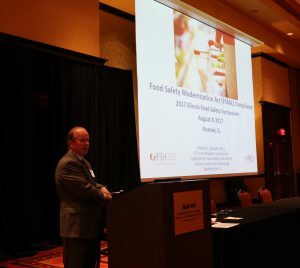 Dr. Bob Brackett at the 2017 Illinois Food Safety Symposium. 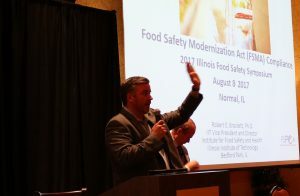 Dave Park speaking at the 2017 Illinois Food Safety Symposium. 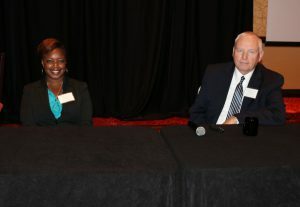 Next, Matthew Botos moderated a panel regarding Distribution and Transportation of Products, featuring the expertise of Tanesia Cole, Manager of Food Regulatory Compliance at US Foods, and Jeff Newey, Manager of Deseret Transportation. Both members of the panel highlighted their individual company’s background; explaining what they ship, how their shipment process works, and the procedures that are in place to ensure safety in the distribution step. Both touched on the transportation rule of FSMA, urging folks to shift their way of thinking to match the safety regulations of the new rule. Tanesia Cole & Jeff Newey at the 2017 Illinois Food Safety Symposium. To close out day one, Matthew Botos, CEO of ConnectFood, and Chris Metz, CTO of ConnectFood, hosted a demonstration of the ConnectFood.com software. I won’t dive too much into detail here, but if you’re interested in a software demonstration, please contact us & we would be pleased to show you around our website. We wrapped up the day with a short reception, and set our focus on day two. 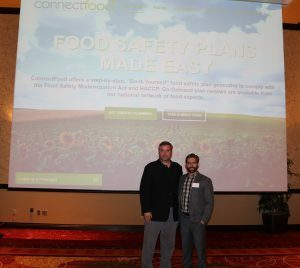 Matt Botos, CEO, and Chris Metz, CTO, ConnectFood, at the 2017 Illinois Food Safety Symposium. 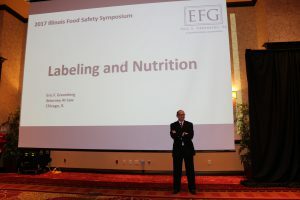 William Weissinger speaking at the 2017 Illinois Food Safety Symposium. Jessica McAnelly, Chief, Division of Food, Drugs, and Dairies at Illinois Department of Public Health (IDPH), took over the podium next. 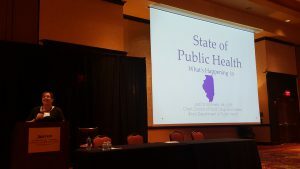 She spoke on the state of public health in Illinois, which ended up being a major talking point for a lot of attendees. She spoke about new legislation and updates to the existing legislation. Allergen awareness training is included in these updates – a main change included was that the certified food protection manager must get allergen training within 30 days of employment at a high-risk restaurant. Another major announcement of this presentation was that IDPH will no longer validate hours for Food Service Sanitation Manager Certification (FSSMC) – the Certified Food Protection Manager is a required, national certification. Jessica McAnelly speaking at the 2017 Illinois Food Safety Symposium. ConnectFood team member Dr. Kathy Knutson moderated our second day panel. (You’ve probably read her outstanding blogs for ConnectFood – if not, check them out here.) 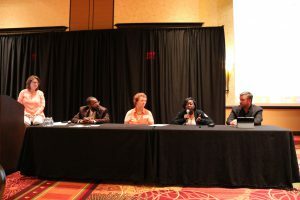 This panel included members Joseph Cooper, Emergency Response Coordinator, Chicago District Office, Mancia Walker, Supervisor, Indianapolis Resident Post OHAFO 6E, and Christinae Hudson, Consumer Complaint Coordinator, Chicago District Office. They discussed Recalls & Outbreaks – what they’d seen, effective ways to handle them, and how important recall plans are for the safety of a company. A crowd pleaser that was discussed was the Blue Bell ice cream recall that was enforced across the state of Texas after the delicious ice cream was contaminated with Listeria. Dr. Kathy Knutson and Matt Botos moderate the Recalls and Outbreaks panel. 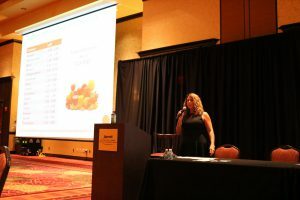 The final speaker at the Symposium was Laurie Jahn, Senior Environmental Health Program Specialist of Lake County Health Department, talking about juice production & safety. The objectives of this presentation were to understand the methods of fresh juice processing, determine the code regulations, and present labeling requirements for bottling fresh juice. The main concerns with fresh juice are the possibilities of cross contamination and that there is no kill step, which leaves the juice untreated. Laurie Jahn speaking at the 2017 Illinois Food Safety Symposium. Matthew Botos wrapped up the Symposium with a final “thank you!” to everyone that joined us. If you attended the Symposium and have some feedback or need to obtain your certificate of completion, please complete this survey. As always, the ConnectFood team is always available to help you understand food safety. All you need to do is contact us. 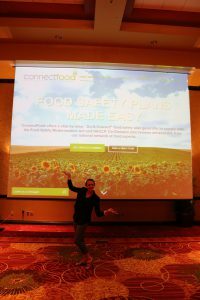 Johanna Seidel, ConnectFood, celebrating the completion of the 2017 Illinois Food Safety Symposium. September 19, 2017 /by Kathy Knutson, Ph.D.